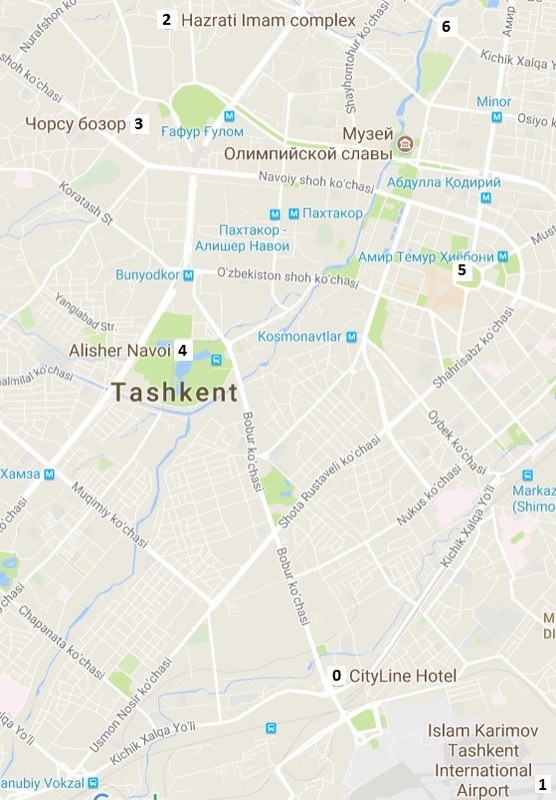 As our flight from Urgench should reach Tashkent by the morning, we'll spend the rest of the day exploring this city. We start early this morning as we must take a flight to Tashkent. When we’re done with our breakfast, the taxi we booked yesterday to Urgench airport by 80000 soms through the hotel is already waiting for us. No issues with our flight at 9:20 AM, so we’re in Tashkent airport by 11 AM. Now we use what we learned a week ago about this city buses to skip all taxi offers and get directly into one of the vans that are waiting on this terminal 3, the one for domestic flights. All buses coming from the airport stop by our hotel, so we’re soon in our room. 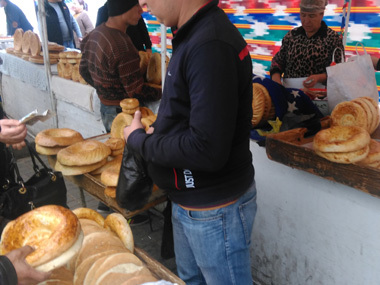 We take some rest and leave the hotel to go to the market Chorsu for the latest shopping. We want to visit Hazrati Imam complex too, which is close to the market. We take bus 92 and go all through the city until the market. As the bus is less crowded than the last time, we can enjoy Tashkent landscapes through the window. We walk through the crowd around the market, where there are even more stands than in the market itself. 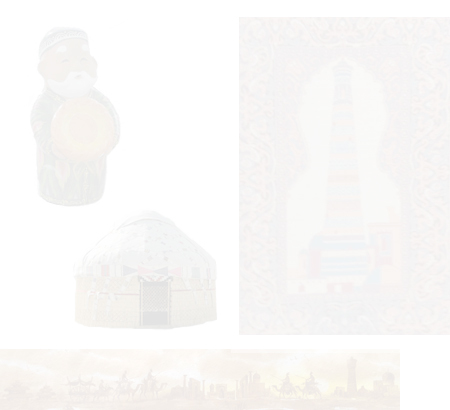 Just around the blue dome are organized stands where I can find what I was looking for: sweets to bring to home. We pay 30000 soms for three different packs of the typical blocks with nuts they have here. Inside if the dome it’s all white and the stands there are mainly selling meat. We leave the place by the opposite side from where we came in and ask for directions to Hazrati Imam complex. We’re answered by pointing to the minarets and roofs that can be seen from here. We follow that reference walking by a wide avenue with some buildings that get our attention. When we reach our destination, we find a big courtyard at our left with two beautiful buildings with blue domes on it. We explore the area with these buildings with an architecture similar of what we’ve seen in the historical sites around the country, but with their specific beauty. We’re enjoying this visit and want to see more things, so we get into the garden looking for more. Mausoleum of Kaffal Shashi appears and we go there with the peace we’re getting from this place. It’s magnificent outside and interior is small. Being alone in this visit to this complex makes us feel like we’re living something exceptional. When we’re finished with our visit, we’re back in the avenue looking for a bus to go back to the hotel. Couldn’t find any convenient for us in the nearest bus stops, so we keep walking down until we reach a strange building we already know from our first day. It has “Sirkus” written on it. As we’ve been here before, we know we can take a bus to the hotel across the road, where we can go through a subway pass. We’re not going directly to hotel, though. We thought about taking our lunch in the same place we ate the first day as I keep in mind tasting that sort of pizza a last time by 20000 soms. We’re keeping an eye to the cash today as we want to spend the local money that we have in order to avoid exchanging more. Since tomorrow, soms will just be souvenirs for us. Like then, this late lunch works as dinner too as it is past 4 PM now. The breakfast and sandwiches we brought to the plane have made the work for us until now. While eating, we can see how they’re cleaning the park outside. Tashkent, and Uzbekistan in general, is quite clean and there is always people working for that, although nothing compares what we’ve seen in Baku. 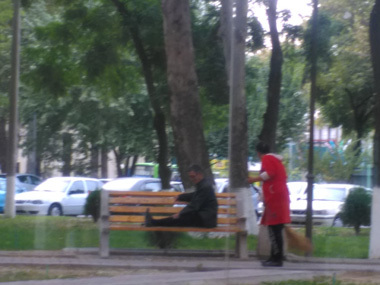 In front of us we can see a woman sweeping the passway through the park using that brooms we’ve seen across the country made of dry branches put together, and making an old man in a bench to put his feet up to allow the brooming underneath. We spend the rest of the day in the hotel, assuming this is the end of this travel.